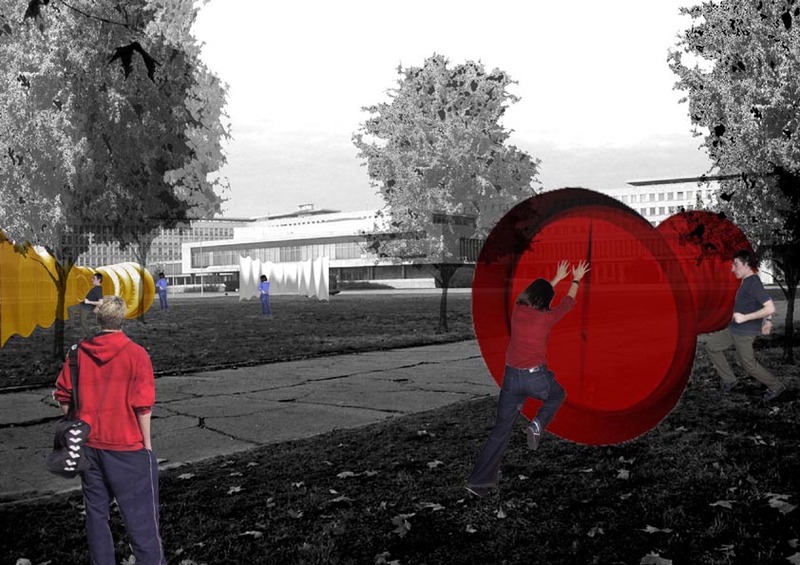 Project named “Public space and play” was part of research on the course of Architectonics, tutored by Ivan Kucina. progressive elimination of all variables until only one of many possible design alternatives was left. The game can be played anywhere in open space, outdoor, favorable parks, squares etc. Barbiecraft game should be distributed across the chosen site as numerous as possible, accessible to any person willing to play. Note: a person who’s dragging through the toy must be a woman, so that she can become at the end “new age hero”. Persons who are assigned for catching “the dragger“ should be men, but it’s not obligatory. Number of persons aloud by trap is max 2. Get through the barbicraft game as quickly as possible. The prototype of barbiecroft is constructed of primary pneumatic construction which is made stronger by secondary ring elements. The toy is controlled only by mechanical elements. The barbiecroft is specially designed, so it can not harm any player. It is also movable and easy to built on the spot. The post-effect of this game is revealing of stress. All participants, after game is finished, should feel better, stress free, as they during the game physically express their negative energy and nervousness.